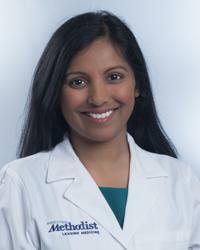 Dr. Tejal Patel is board certified by the American Board of Internal Medicine in medical oncology and hematology. She is a breast medical oncologist and specializes in the treatment of breast cancer. She leads the High Risk Program at Houston Methodist Cancer Center which includes working with genetic counselors to identify and counsel patients at high risk of breast cancer whether due to a genetic mutation, family history, or abnormal biopsy. The goals of Dr. Patel's practice are to offer the best care possible while helping patients maintain a good quality of life, and to help patients understand their disease and options which makes the cancer journey easier. After completing medical training at The University of Texas Medical Branch at Galveston, Dr. Patel completed her residency in internal medicine as well as her fellowship in hematology and oncology at Mayo Clinic School of Graduate Medical Education in Florida. Dr. Patel serves as the course director for the annual Houston Methodist Cancer Symposium and is the program director for the Hematology-Oncology Fellowship Program. She is a member of the American Society of Clinical Oncology and the American Society of Hematology. Dr. Patel sees patients at Houston Methodist Hospital.